Translating from CAD to GIS enables the CAD drawings to become enhanced with spatial information and attributes. The data in a CAD file requires manipulation to extract valuable information, such as geometries and labels, to fit the data structure of GIS data. This article provides an overview of some common tasks involved in a CAD to GIS transformation. Transfer attributes by overlaying text features onto polygons representing districts from the DGN file, and write to a new polygon Esri Geodatabase feature class,"District"
Create polygons from lines representing parcels in the DGN file, overlay parcel text features with the parcel polygons, and write to a new polygon feature class, "Parcel"
In the workspace, the MicroStation DGN (*.dgn) file (NorthVancouver.dgn) is read using the Bentley MicroStation Design (V8) reader. Under Parameters, Group Elements By > Level Names is selected, so that the feature types will be represented by name rather than by number. 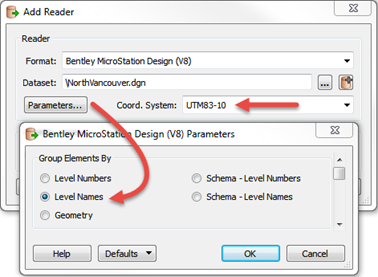 If known, you are required to specify the coordinate system in the Coord. System parameter. In this case, the Coord. System is set to UTM83-10. the PointOnAreaOverlayer transfers BlockID and District attributes to District polygons in the Esri file geodatabase. Some text features representing length are one feature (e.g. “24.11”), whereas others are separated into contain multiple pieces of text (e.g. “2” “4” “.” “1” “1”). The multiple pieces of text first need to be combined into one text feature. We use a StringLengthCalculator and Tester to separate the single pieces of text from the multiple pieces. An interpolation angle must be specified to control the smoothness of the stroked arcs in the output buffer boundaries. 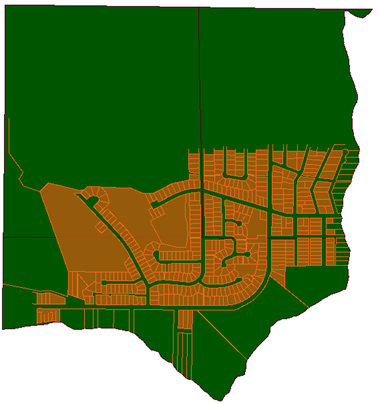 NeighborFinder matches ParcelBoundary lines and arcs with the ParcelLineLength text features. ParcelBoundary lines and arcs which have matches will obtain Length and District attributes from ParcelLineLength. Tester: If the difference between the line length label and the calculated length (from the LengthCalculator transformer) is less than plus or minus one, the Length attribute is kept and populates the Length attribute of the ParcelLines feature. If the difference is greater than plus or minus one, the Length attribute is removed. Features are written to the ParcelLine feature class. This workspace writes using an Esri File Geodatabase (File Geodb Open API). The Writer parameter is set to “Yes” to Overwrite Existing Geodatabase to ensure any existing database is deleted before writing begins. The data used here originates from open data made available by the District of North Vancouver. It contains information licensed under the Open Government License - North Vancouver.